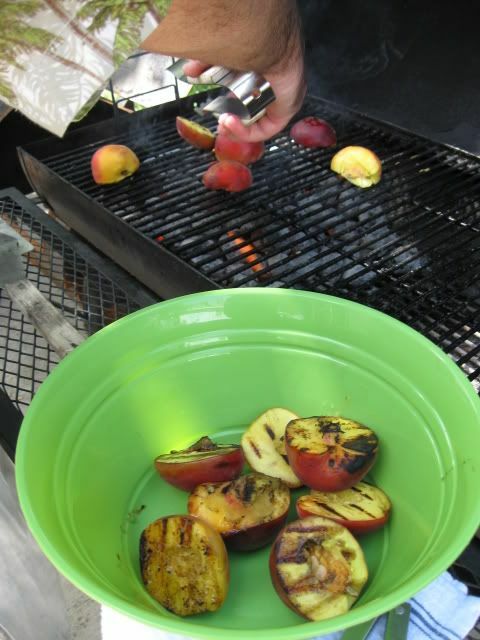 Once they all had a nice set of grill markings I took them back inside and removed the pit, chopping the peaches into large chunks in the process. 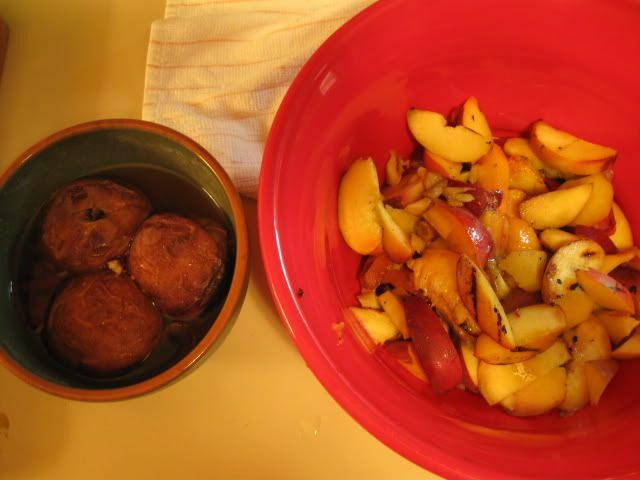 Rivet had taken 3 peaches the night before and baked them with some peppers from the garden. The next morning I took them out of the fridge and they looked like he’d blanched them. The juice had leaked out and helped the skin come off. I chopped those 3 up as well and added them to the mix. 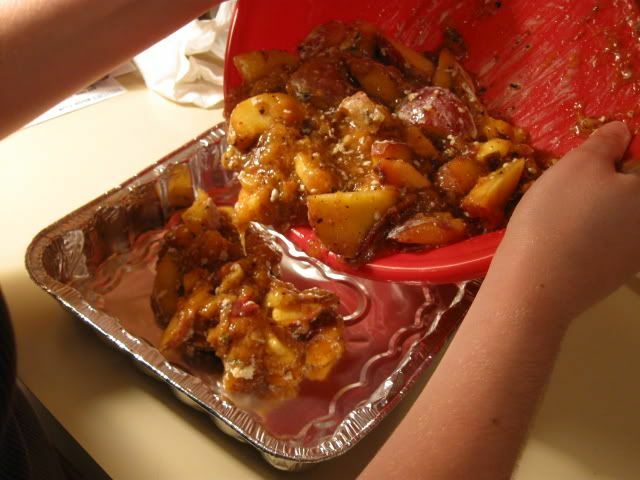 I then mixed brown sugar, butter, and freshly ground cinnamon sticks (ruining the coffee grinder in the process ) to the peaches. 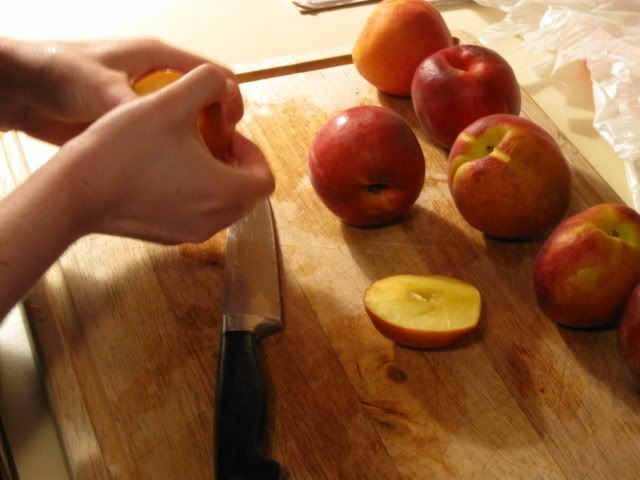 The recipe also said to add flour to the peach filling. I remembered the advice I’d received on my blueberry pie to use tapioca instead. Against my better judgment, I used flour, thinking I should follow the recipe the first go around. Never again. 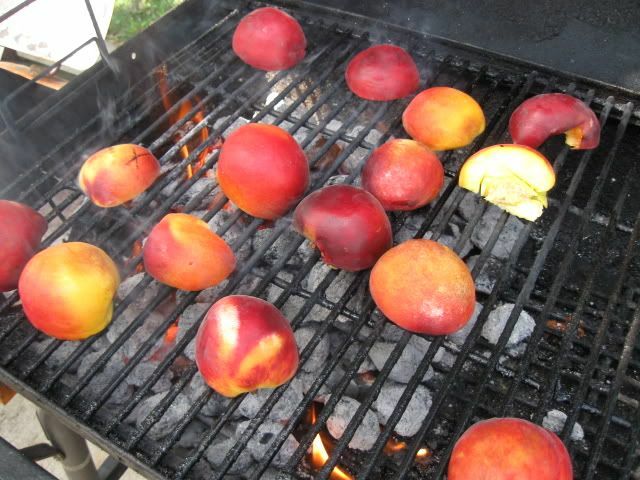 But I’ll get to that in a sec… I poured my peaches into the pan. 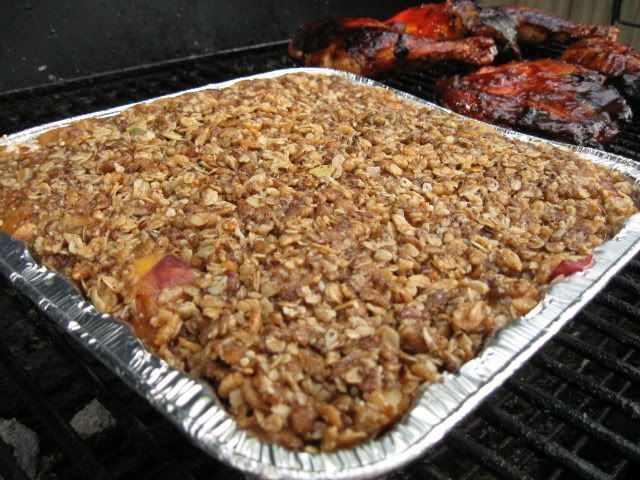 Topped them with the granola with a little brown sugar, butter, and cinnamon added. Then it was off to be grilled alongside our chicken for dinner. I forgot about the plated pics, but that’s ok. It looked like a big brown mess. 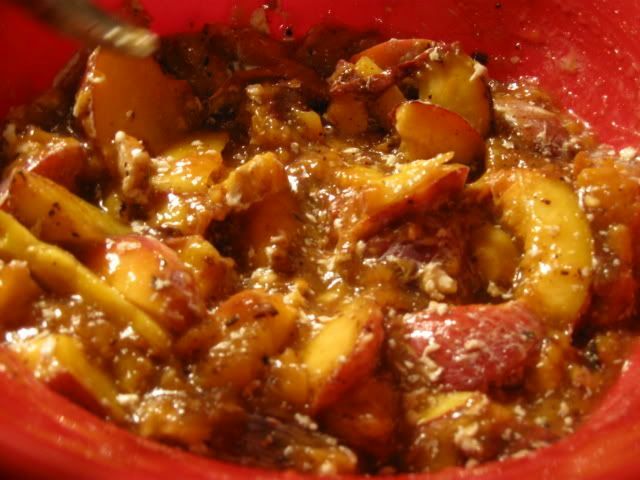 The peppery peaches made this dessert very interesting. While the peaches did have a smoked flavor, the peppers gave it an unusual zing that felt like it kicked the back of my throat on the way down. The filling was a bit runny again (Tapioca for sure next time!) and it didn’t keep well because the granola got soggy after a while. I definitely learned a few things on this one which = great success! I thought it was "deliciously snappy" and a very nice crisp. Although a nice "crisp" style-topping instead of granola would have made it A-1 plus-perfect-outstanding, this was a mighty fine and delightful peach dessert! Now you just have to keep on your cobbler-quest and make more! it sure looks delicious to me! and i am willing to bet that the grilling added a whole new dimension of flavour! great job!